Last week, I asked the following question: What would happen if we took time when things were calm to prepare for the inevitable storms that come with life? 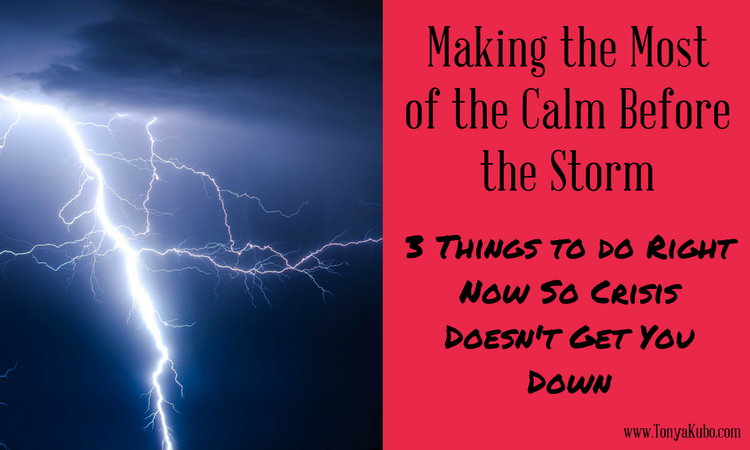 I asked readers here, on Facebook and on Instagram to share their fears and concerns around the storms of life and offer tips for others. The been-there-done-that responses might surprise you. Her dual-income household means paid time off for both she and her husband. They both have family-friendly employers and friends who stood in the gap while they focused on their family’s needs. They have excellent medical coverage, with estimated out-of-pocket expenses amounting to less than what some folks spend at Starbucks each month. Krista’s burden was lighter, because she has a village supporting her, job security and benefits. This was also a one-time thing. Her son’s illness was acute and treatable. The memory of this experience will fade over time. Being an entrepreneur affords her a certain flexibility when the storms of life hit. With modern technology, she can conduct much of her business from anywhere in the world. She also has a village — friends and family both near and far who will drop everything and lend a hand at moment’s notice. What can we learn from these two women about embracing the calm before the storm? A lot. We may not have the same struggles or resources, but there is a lot of common ground shared by all moms. Talking with Krista reminds me that for most of us, money is the tipping point in crisis. Medical bills we can’t pay. Loss of income. Expensive car repairs. An emergency fund makes the difference between personal crisis and personal devastation. Finance expert Dave Ramsey recommends $1,000 in savings for emergencies. If that’s something you have or can build, you’ll be able to weather the storms of life with greater ease. This helped my family weather the scary storm of bank fraud that left our household account overdrawn. Because our emergency fund is housed in a different bank account, we were able to get by until our money was returned. But what if $1,000 in savings is out of reach for your family? Are you out of luck? I don’t think so. For us, “emergency fund” isn’t just a monetary thing. Extra cash is always helpful, but there are other “funds” that have cash value in an emergency. Freezer meals are one example. Taking a family of four out to eat can cost up to $50. Ten meals in the freezer ready to go would then save $500. No freezer space? Pantry meals are another resource. Canned beans and tomatoes turn into chili with minimal extras needed. Same with pasta and sauce or rice and veggies. Emily runs her home as if everyone is team MVP. Her kids do more around the house than most, and she recognizes they can probably do even more. Having a routine in place where everyone is responsible for tidying up their own areas and choosing outfits before bed makes normal mornings easier. And for Emily, it’s a huge help when life goes haywire. Other readers agree. I’ve heard of kids as young as 7 doing their own laundry and keeping house. OK, the latter was my 7-year-old who had a deep love for doing dishes and mopping the floor. It’s not something I would have thought a child her age could do, but at 8, she’s as good as me at cleaning floors now. Systems like this keep the family engine going in times of crisis and offer our children a sense of security in uncertain times. If your kids are already used to doing their own laundry, packing lunches and tidying up, it’s not so scary when mom or dad are out of commission for a bit. We’re more mobile as a society compared to preceding generations. Our nearest relatives might live in a different county, a different state or a different country. We may not have a village in the traditional sense of the word, but we can cultivate one no matter where we live. I have my Mommy Dream Team, which is critical to the pace in which my family lives. But even if you don’t need support on the daily, it makes sense to gather up your resources, so you know what you have to work with in desperate times. For example, my husband and I know a retired couple who live two houses down from my daughter’s school. These folks are not part of my family’s regular routine, but we have an agreement. If something big were to happen and we couldn’t get to my daughter, she could walk there after school and be safe until one of us arrives. I hope never to have to activate that plan, but having the plan brings comfort to all of us — including my daughter, who has a lot of “what if bad people came to my school” fears. Now that we’ve explored what works for other families, what about you? Do you already have an emergency fund, “what if” systems in place and a village to deploy in stormy seasons of life? What’s the one thing you could do today to take one step closer to expecting the unexpected in life and planning according? Comment below so we can learn from each other. Tonya Kubo is a full-time working mom of two spirited girls living in the heart of California. She counts her husband, Brian, as Team Kubo’s MVP. Her free resources, “Why You Need a Mommy Dream Team” and “Four Lies You Believe About Clutter” are available to download here. Connect with Tonya on Facebook or by commenting here. One thing I did early on, is teach my kids to cook. Always age-appropriate use of appliances…starting with the microwave first then stove or oven at teen years. Sometimes we don’t consider a crisis that might include taking spouse to hospital or if they are home and sick in bed. It is a helpful skill! Great ideas and planning strategies! That’s a wise decision. Can you offer examples of some of those early meals? Hot Pockets? Quesadillas? There were a couple things I did early on with my girls that proved to help when my sister was dying and I couldn’t be home a lot. They learned from a very early age how to sort clothes (colored, whites, darks, towels) and how to do laundry. I also made them pump gas as soon as they started learning to drive and to go to the post office and buy stamps. They each had chores from age 4 like dumping trash cans and keeping things picked up and learning to clean bathrooms and run the sweeper. Such simple things but when I couldn’t be there and things needed to get done, I was glad they knew how to do laundry, buy groceries, keep things picked up and do housework. Also our church family would do anything for us and that is a system that works for all emergencies! ? Life skills come in handy at all ages, don’t they? Subscribe to the Great Moms mailing list and never miss a blog post or encouragement for moms just like you. You'll receive the Family Blueprint right away! You have been the end-all-be-all for so long, and I know reaching out for help hurts. Thank you for contacting me! The impact of you trusting me with what weighs on your heart and mind is not lost on me. I promise to read every message, and I may use your letter (but never your name) in a future post or on social media. Privacy is ALWAYS protected. If you don’t want any part of your letter published, just let me know!